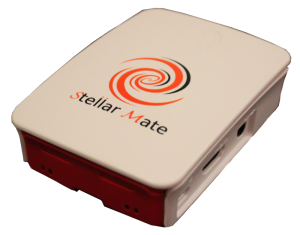 StellarMate’s controller offers a unique Internet of Things (IoT) device that provides the flexibility to control a lone mount in the field or to coordinate the orchestration of a state of the art observatory. You can connect your equipment (mount, DSLR/CCD, focuser, filter wheel, etc.) to StellarMate via USB/Bluetooth or by network. You then connect to StellarMate from either your mobile phone/tablet or laptop/ desktop computer. Once setup is completed, you can start controlling your imaging gear from any major platform. 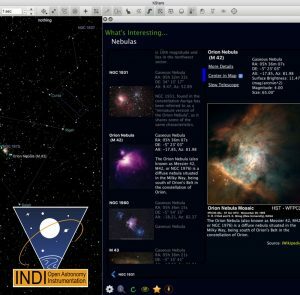 StellarMate is powered by the Open Astronomy Instrumentation protocols (INDI), and Ekos, StellarMate’s free astrophotography software which is a cross platform astrophotography suite for Windows, MacOS, and Linux. It supports highly accurate GOTOs, autofocus and autoguiding capabilities, in addition to powerful image acquisition features and support for numerous mounts, CCDs, DSLRs, focusers, and much more. – Mounts: Meade, Celestron, SkyWatcher, Paramount, IOptron, Avalon, Takahashi, Argo Navis, 10-Micron, Losmandy, EQMod, and more. – Cameras: Canon, Nikon, Sony, & Pentax DSLRs. SBIG, QHY, QSI, FLI, Starlight Xpress, DMK, Apogee, iNova, ATIK, ZWO ASI, Morovian, Meade DSI..etc..
– Filter Wheels: ZWO, ATIK, Apogee, Starlight Xpress, FLI, QHY, and more. – Focusers: FocusLynx, TCF-S, MoonLite, RoboFocus, NStep, Pegasus, Baader, Microtouch, and more. – Rotators: Nightcrawler, Optec Gemini Focusing Rotator, Optec Pyxis. – Domes: Baader, MaxDomeII, NexDome, plus support for custom roll-off. – Weather: Sky Quality Meter, Vantage Pro, WunderGround, Arduino MeteoStation. – Spectrographs: Spectracyber & Sheyalk. Detectors: Software-Defined-Radio (SDR-RTL) based detectors. – Auxiliary: Flip Flat, Game Pads, GPUSB, GPS. – More drivers are added on a regular basis by the astronomical community and manufacturers. Other functionality includes the ability to measure and correct polar alignment errors and capture of single or stack of images with filter wheel support. You can either use the built-in Ekos Astrophotography Tool, or download it on your Windows, MacOS, or Linux computers to remotely control StellarMate from anywhere. In addition to Ekos, StellarMate is compatible with many more applications, including PixInsight, PHD2, Sky Chart, and many more. StellarMate is shipped with KStars, a modern feature-rich planetarium software for all platforms. It provides an accurate graphical simulation of the night sky, from any location on Earth, at any date and time. The display includes up to 100 million stars, 13,000 deep-sky objects, all eight planets, the Sun and Moon, and thousands of comets, asteroids, supernovae, and satellites. Hundreds of full-color catalogs, covering the whole electromagnetic spectrum from radio to gamma rays, can be overlayed directly on the sky map. It supports adjustable simulation speeds in order to view phenomena that happen over long timescales, the KStars’ Astrocalculator can be used to predict conjunctions, and many common astronomical calculations. It includes a powerful observation planner, a sky calendar tool, and an FOV editor to calculate field of view of equipment and display them. Find out interesting objects in the “What’s up Tonight” tool, plot altitude vs. time graphs for any object, print high-quality sky charts, and gain access to lots of information and resources to help you explore the universe. StellarMate now ships with a Real-Time Clock with battery to keep StellarMate time accurate even when power is off. A real time clock is critical for accurate astronomy & astrophotraphy work. – Real Time Clock (DS3231) with battery. – Storage: 16GB MicroSD card class 10. – HDMI: 1.8m Gold Plated HDMI cable. – Power: 2.5A 5v power supply with convenient on/off switch. The power supply plug is US-type, however, a European-type adapter is also included.